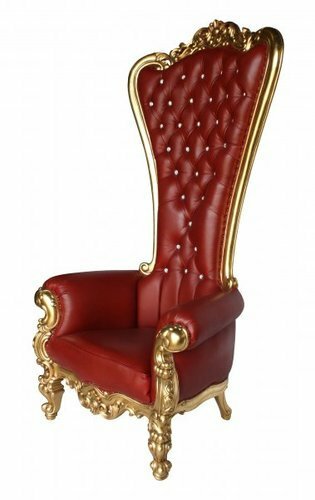 As a quality driven enterprise, we are engaged in providing a beautiful range of White Metal Majestic King Throne Chair Dark Red. Established with a motive to make Exotic Indian Handcrafted products available globally, Luxury Handicrafts was introduced. We, at Luxury Handicrafts offer products crafted with Bone Inlay, Mother of Pearl Inlay, Antique Metal, White Metal, Pure Silver, Meenakari, Sagwan Wood Furniture, Marble Products, Modular Furniture, Hand Carved furniture, etc. with utmost precision and perfection owing to which these display elegance, optimum creativity and excellent work of craftsmanship. The attractive appearance and enthralling designs of our products make are widely used in various hotels, offices, homes and other establishments for enhancing and presenting the Luxurious looks of the interior. Our offered products are extensively used by the customers for decorating home with a luxurious touch. Also, for gifting purposes to near and dear ones. Luxury Handicrafts is a professionally managed export house. Presenting a perfect blend of traditional and modern designs, Luxury Handicrafts has managed to acquire a special place amongst the finest manufacturers and exporters of marble and wooden handicrafts of the country. We have a passion of promoting and conserving our design house by constantly developing new designs with innovative ideas and creative execution. Customized Products is our USP (unique Selling Proposition) and this ideology of our Directors, has made this business Stand Tall and Different from the other handicraft manufacturers. Both of our directors, one from Commerce and another from Science Educational Background together are aimed at making everyone to get Feel of Luxury at their Home, Office, etc. with their “Because everyone deserves luxury” approach thus making “Luxury Handicrafts” a global brand.We Manufacture and Export any number of pieces, whether 1 or 1000 as per custom sized asked by our customer at no additional or higher costs. Quality being our ethical business policy, whatever we manufacture is marked with our Logo. which in itself is a mark of our Quality Product. We make no compromises on Quality as we serve people from every country in the world and we believe every person is Royale in its own way, therefore, “Luxury Handicrafts”. Our skilled designers & workers, who excel in creating contemporary fashion by merging ancient exclusive traditional designs and modern era requirements. known as City of Lakes and Venice of the East, we manufacture in the Hub of Handicrafts. Continuous Supply, as we serve both national and international market, we have a 24 hour shifts based manufacturing units to ensure continuous production. Tie ups with Leading Logistics firms ensures timely supply to all. Up-gradation of our production techniques and designs according to the world standards. Unbelievable Low Prices quotes by us is been a talk amongst our buyers. Making Our business unbeatable in the market.